With winter just around the corner, it’s time to think about putting your RV into safe storage for the long cold months ahead. Should you take your RV back to the dealer to have it winterized? Or is this something you can do yourself? RV dealerships are only concerned with what damage ice in the water system will do to your RV. When water freezes and turns to ice, it expands. This will cause pipes to split, tanks to rupture, and pumps to fail. 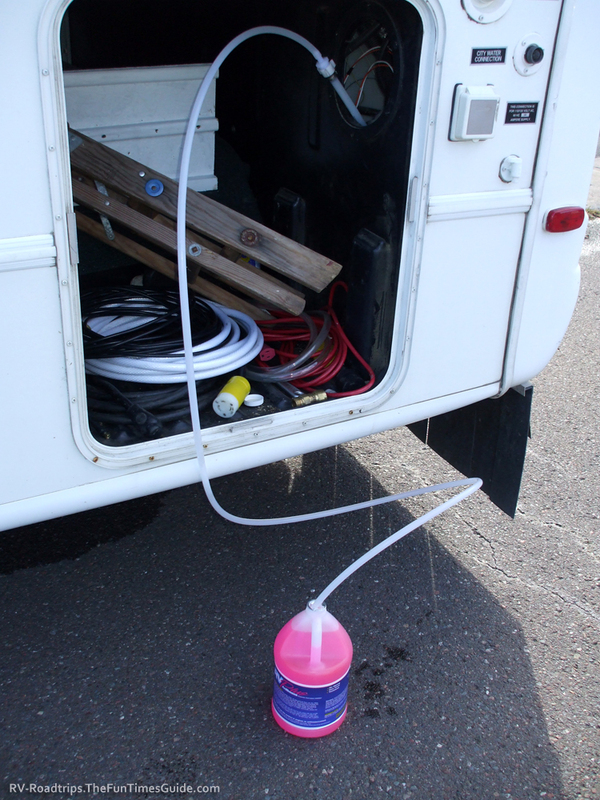 To properly winterize your RV water system you need to drain it, evacuate the remaining water with compressed air, and pump RV antifreeze through the system. RV dealers will perform this service for you, but their labor rates are close to $100 an hour. Learning how to winterize your RV water system might take a little effort the first time around, but next year it will be a snap. Damage to an unprotected water system will easily run over $1,000, which is why this is considered the most important first step in the winterization process. If your RV is equipped with a generator you need to drain it of fuel. Left for months, fuel can turn to lacquer that will plug the jets in the carburetor. Next spring, getting it to start might require a sizable repair bill if you don’t allow it to run out of gas before putting it in storage. Your RV generator may not have a fuel shut-off valve installed from the factory, but installing one is well worth the effort. With the generator running, shut off the fuel valve and allow the generator to run until it quits from lack of fuel. Be sure to push the kill switch after it stops running — because, if yours is like mine, the electric fuel pump continues to run as long as the run button is in the ON position. RV trailers may only have one battery, while motorhomes may have 3 or 4. For a single battery, you should disconnect and remove it to be stored in a warm environment. Make sure the water level is sufficient and that the battery is fully charged, then put it in a safe place. Make sure it’s not sitting directly on a concrete floor — because that will allow the battery to slowly drain. If the garage floor is where you plan to keep it, put it on a piece of plywood. If your motorhome is equipped with multiple batteries and a battery disconnect system, you can prepare your batteries as stated and turn off the disconnect. Installing a solar trickle charge system will help keep your batteries fully charged too. Simply set it on the dashboard where sunlight can get to it, and plug it into the cigarette lighter. Don’t forget to remove small batteries too — because they can freeze, leak, and become destroyed. Remove the batteries from TV remotes, smoke and carbon monoxide detectors, and don’t forget the clock on the wall. Remove all food items from your RV. That includes boxed dry goods as well as canned goods. Cans can freeze and split, and dry goods will keep winter rodents fat and happy. Keeping mice out of your RV can be a real problem. They will chew up fabric or insulation to make nests, and they can damage wiring and other non-food related items as well. Setting a good multiple catch mouse trap will keep your RV secure as four-legged intruders try to make their home inside your RV. Over the winter months any dirt, grime, or road chemicals not removed from the exterior of your RV will continue to rust, dissolve, or discolor the finish. This will quickly age your RV and spoil that shiny new look. In many dusty regions, county highway crews often apply calcium chloride (liquid salt) as a dust control agent on dirt roads. It can create pits and corrosion on aluminum wheels — just like winter road salt does to your car. The best protection is a good wash and wax before you store your RV for the winter. Sun damage will cause fabrics to become brittle, plastic to yellow, and carpeting to fade inside your RV. To prevent this, lower the shades, cover the windshield, and do whatever you can to keep direct sunlight from beaming into your RV. Also, make sure all of the windows are closed and latched, and that the roof vents are closed tight. Unlike rain, snow will blow around and even with Maxxair vent covers it will get in through any opening. Motorhomes need a little more attention than RV trailers. The most critical thing is to make sure your engine coolant is protected from cold temperatures well below zero. Any plain water you may have added over the summer will dilute the mixture, raising the temperature at which your coolant will freeze. It needs to be protected at least to -30 degrees Fahrenheit. Fall is a good time to do any servicing on your RV — such as oil changes and chassis lubrication. A fresh oil change will remove any impurities that might be lingering in your old oil. Additives break down, and acids build up. By doing your servicing in the fall, once those first warm days of spring return you’ll be ready to go. Topping off the fuel tank will also prevent condensation from forming in the tank. Moisture leads to rust and corrosion which can plug fuel filters and fuel systems. Make sure all of your RV tires are properly inflated. Sitting for months with under-inflated tires can cause flat spots to develop. Even worse, if allowed to go flat, sidewall cracks and weak spots will be the result. In addition, the sun’s ultraviolet rays will rot your tires causing them to fail unexpectedly. So be sure to install RV tire covers to keep the sun’s rays from getting to them. 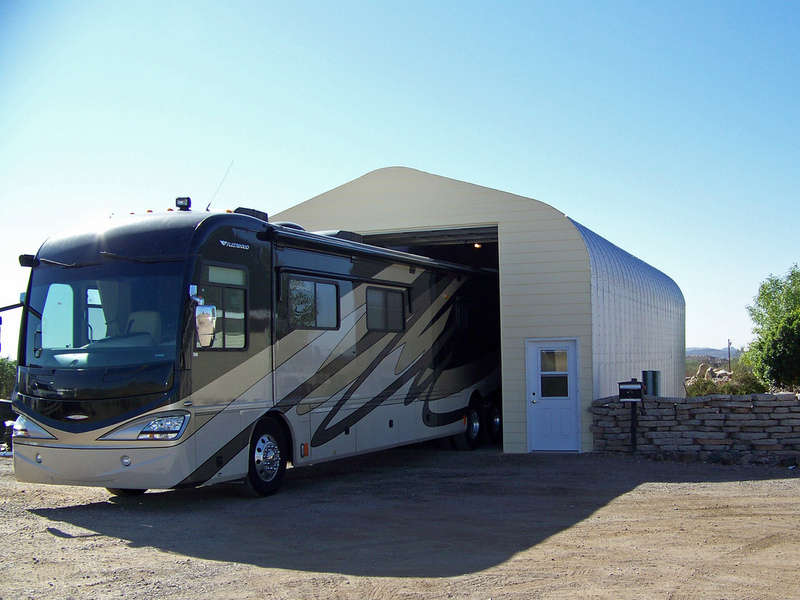 The absolute best option is to store your RV fully protected in a heated garage or storage building. For most of us, this isn’t an option. Most often, it’s a matter of parking the RV where it fits — be it beside the garage or off the side of the driveway. A second choice for parking would be a concrete or blacktop parking pad. Next, would be a well drained dry gravel parking pad. The last choice would be somewhere on the lawn in the backyard. Parking on the lawn creates all sorts of problems. Next spring, the lawn will be the last place to dry up enough to allow you to safely move the RV. All this moisture will wick up into your RV, rusting the undercarriage, wheels, brakes, etc. Weeds will grow and stain the outside of your RV, and rust will spread faster than arthritis to every corner of your RV. You can lessen the chance of moisture damage by placing a layer of heavy plastic on the ground under your RV. For some, due to zoning restrictions or lack of space, renting space in a storage lot is their only option. Be aware that storage facilities are not held liable for any damage to your RV for any reason. You must maintain comprehensive or storage insurance if you expect to be reimbursed in the event of vandalism, theft, fire, or any other calamity that may affect your RV while it’s in storage. Snow Load Warning: Because RVs are made as lightweight as possible, they can’t handle the weight of deep snow on the roof. Winter snow load can seriously damage your RV. Too much weight can collapse the roof, split seams, and distort side walls. Even worse, when snow is allowed to accumulate on the roof, the layer close to the roof will often melt and remain wet while the outer crust stays frozen. Snow acts like an insulator. As the heat of the sun warms the interior of your RV, that first layer of snow melts and can stay wet. Water from snow melt will seep into the tiniest of openings resulting in water stains, delamination, and soft spots on the floor. These kinds of RV repairs are very costly — sometimes well beyond the value of the RV. Sun and snow are your RV’s worst enemies. In addition to protecting your tires with tire covers, if your RV will remain outdoors throughout the winter, it’s important to protect the RV itself with a cover as well. 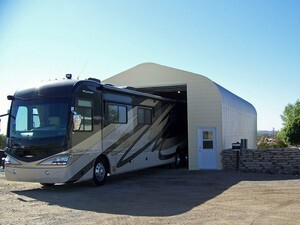 An RV garage or canopy protects your RV investment from sun and weather damage. As a less expensive alternative an inexpensive, plastic tarp will go a long way in preventing both sun damage and water infiltration from melting snow. Don’t scrimp, the more of your RV you cover, the better. CAUTION: The bungee cord is the most common way of attaching a plastic tarp over an RV. The metal hooks, though plastic coated, will cause damage if allowed to rest on the finished surfaces of the exterior of your RV. Wind will move them around, and by spring there will be bare metal showing where paint should be. A simple way to avoid this damage is to take strips of old bathroom towels and wrap the hooks — securely tying them in place with string. Refrigerator – The doors should be left open to allow the interior to stay dry and prevent mildew from forming. I use bungee cords to hold them back, so they can’t mysteriously close on their own. Washer/Dryer, Ice Maker, Filtered Water Faucet, Outdoor Shower – These are accessories that you might miss when draining your water system. Be sure to include them or they will be damaged during freezing conditions. Propane – Make sure the propane is shut off at the tank. A leak could allow fumes to build up in your RV leading to a possible fire or explosion. Once you have made it to this point, you can feel comfortable that you have properly winterized your RV better than any RV dealer would have done for you. Next spring, you’ll be ready to travel and camp again, without the worry of what’s not going to work, or what will have to be repaired. By the way, you might want to use an RV checklist for your winterization project and other maintenance issues. That way, you’ll be sure not to overlook anything!